This is good, but simplenote is still simpler. It's easy to lose track of what you're supposed to do each day when you're bombarded with e-mail requests. And it can be a hassle to set a separate calendar alert every time you're e-mailed a new meeting time or appointment. Two new startups hope to simplify reminders by delivering them directly to your inbox when you need them. 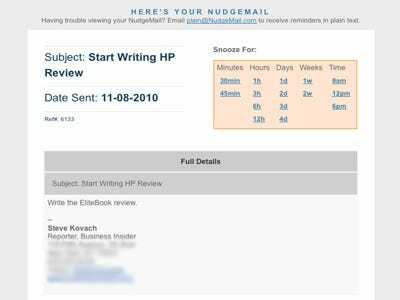 Nudgemail, allows you to set alerts for events by sending the service an e-mail with the time you want to be reminded in the To field. You can also forward messages to Nudgemail and have them sent back to you are ready for them. Followup.cc does much the same thing as Nudgemail, with the addition of an online calendar for managing your reminder and the option to include multiple recipients in the CC or BCC fields. The best thing about these services is that they can be accessed entirely over e-mail. There's no need to download special software, apps, or access a web utility. All you need is an inbox.